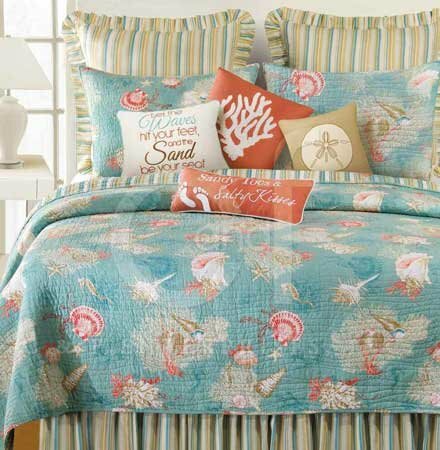 Shells, sea coral, seahorses, and starfish in white, taupe, and coral on a beautiful aqua background. Reverses to a coordinating stripe in aqua and tan. Cotton Filled, Prewashed, Luxury Oversized. 100% cotton face, polyester backing. 90" x 92". Fits full and queen size mattresses. We offer the complete ensemble in the Santa Catalina pattern by C & F.